There were actually two posts ready, and we decided to go with this one. All y'all know my love for Southern Rock, but as is the case around here more often than not, we are not taking the direct route so... nope .....not the Allman Brothers. We will have a header designed before our next chapter. We are thinking we might even do a multiple part series at some point. We really would appreciate feedback on the idea of this feature as a whole. It was 1964 in Jacksonville, Florida when 5 teenage friends began playing in a band together, which they named MY BACKYARD. Their early influences included FREE, THE YARDBIRDS and THE BEATLES as well as the southern blues and country and western they had grown up on. 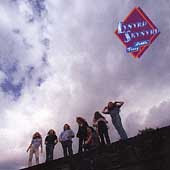 The five teenagers were Ronnie Van Zant on vocals, Allen Collins and Gary Rossington on guitars, Larry Junstron on bass and Bob Burns on drums. Throughout the 60’s the band changed names including THE NOBEL FIVE and ONE PERCENT. They played local dance clubs and bars and began to develop a following. In 1968, they won a “Battle Of The Bands” contest and used the money to record two songs; “NEED ALL MY FRIENDS” and “MICHELLE”. Additionally this win gave them the opening spot for the Southeast shows being performed by the STRAWBERRY ALARM CLOCK. In 1970, the band’s roadie, Billy Powell joined the group as keyboardist and they began to rehearse at an isolated farm outside Jacksonville, which they christened ‘Hell House’. In a mocking tribute to this teacher, the band bastardized his name when deciding on the new name for the band. The teacher, Mr. Leonard Skinner…the band Lynard Skynard. They began playing across the South, honing their skills and working on their song collection. In 1972 Leon Wilkeson replaced Larry Junstrom on the bass. Strangely enough, Wilkeson then left the band as they were about to start recording their first album. 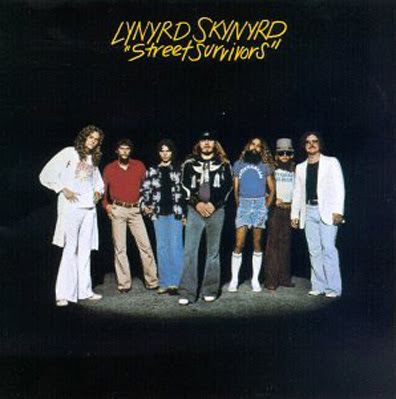 In 1973, as a tribute to the BYRDS, the band changed the spelling of their name to the now well known LYNYRD SKYNYRD. While playing at a club in Atlanta, Al Kooper of the band BLOOD SWEAT AND TEARS heard and fell in love with their sound. He immediately signed them to MCA Records. He was the producer for the first album “LYNYRD SKYNYRD (pronounced leh-nerd skin-nerd)”. 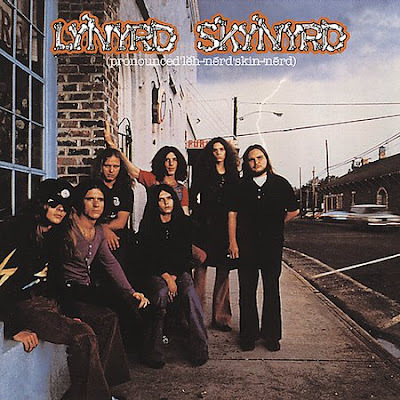 The album contained the song which would be associated with the band forever…”FREE BIRD”. It reached #19 on the Billboard Hot 100 charts that year. The band called on the the guitarist for the Strawberry Alarm Clock, Ed King to play bass on the album. When it was completed, Van Zant called King “the worst bass player I’ve ever played with”, and then convinced Wilkeson to rejoin the band as the bass player and had King go back to the guitar, giving them the ability to play the three-guitar part they had created in the studio using over-dubbing. In 1973, a big break came about when the band was asked to open for THE WHO for their “QUADROPHENIA” tour of the U.S. This helped them to gain a larger audience then they had been able to prior. 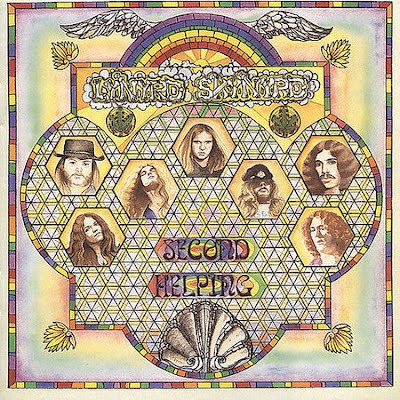 Their second album “SECOND HELPING” was released in 1994 and included the hit “SWEET HOME ALABAMA” (King/Rossington/Van Zant) a song written in response to Neil Young’s two songs "ALABAMA” and "SOUTHERN MAN”. “Sweet home Alabama” hit #8 on the charts that August. The album reached the #12 spot. In 1975 the band toured the U.K with GOLDEN EARRING and did the same in 1976 with THE ROLLING STONES. In 1975 Burns left the group and Artemus Pyle from North Carolina became the bands drummer. “NUTIN’FANCY” was released in 1975 and became the bands first Top Ten album. "SATURDAY NIGHT SPECIAL” from that album hit #27 on the Billboard Hot 100 chart. Also in 1975 the band added the “HONKETTES” to the band. They were Leslie Hawkins, Cassie Gaines and JoJo Billingsley, and they added a special background touch to the band’s set. In the middle of the tour to support the album Ed King decided to leave the band. They continued on for a while with only two guitarists, but eventually brought in Steve Gaines (brother of Cassie), to be their third guitarist. The band put out a double-live album called “ONE MORE FROM THE ROAD” with the latest lineup in place. It became a Top Ten hit and the band was on their way once more. 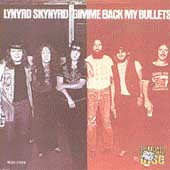 Their next album, “GIMME BACK MY BULLETS” was released in 1976, to less acclaim then their pervious efforts. Three days after the release of “Street Survivors” a chartered Convair 240 was carrying the band between shows in Greenville, SC and Baton Rouge, LA. Somewhere near a forest close to McComb Mississippi, the plane went down. Killed in the fiery explosion were Van Zant, Steve Gaines, Cassie Gaines, assistant road manager Dean Kilpatrick, co-pilot William Gray and pilot Walter McCreary. Artimus Pyle crawled from the wreckage with several broken ribs. He and surviving crew members Kenneth Peden, Jr. and Mark Frank hiked through the woods until they were able to locate help. Allen Collins had two cracked vertebrae in his neck and he and Wilkeson nearly had arms amputated as a result of injuries. Wilkeson also suffered a punctured lung and lost most of his teeth in the crash. Rossington had both his arms and both legs broken in the crash. Leslie Hawkins had a concussion, broke her neck in three places and had severe facial lacerations. Security manager Gene Odom was seriously burned on his arm and face and lost an eye when an emergency flare was set off during the crash. Billy Powell almost had his nose ripped from his face and had severe facial lacerations. The last member of "The Honkettes", JoJo Billingsley was not on the plane for the flight, having gone home to take care of family business. An interesting note… The Convair 240 itself had been inspected by members of AEROSMITH'S flight crew for possible use in the early summer of 1977, but was rejected because it was felt that neither the plane nor the crew were up to standards. In an interview in the book "WALK THIS WAY", Aerosmith's assistant chief of flight operations Zunk Buker tells of seeing pilots McCreary and Gray trading a bottle of Jack Daniels back and forth while Buker and his father were inspecting the plane. "The National Transportation Safety Board determined that the probable cause of this accident was fuel exhaustion and total loss of power from both engines due to crew inattention to fuel supply. Contributing to the fuel exhaustion were inadequate flight planning and an engine malfunction of undetermined nature in the right engine which resulted in higher-than-normal fuel consumption." 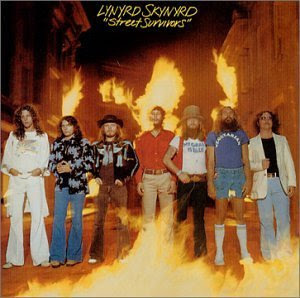 In an eerie foreboding, the original album photo for “Street Survivors” showed the band surrounded by flames. The record company, MCA, withdrew the original sleeve and replaced it with a picture not containing the flames. The band announced they were breaking up after the accident. This is to be expected as they all needed time to heal their wounds both physical and mental after the loss of their friends. Rossington and Collins formed THE ROSSINGTON-COLLINS BAND between 1980 and 1982, releasing two albums. Neither was met with overwhelming desire by the public, but contained some good tunes. Pyle formed THE ARTIMUS PYLE BAND in 1982. Again...nothing really came of this venture. Collins formed THE ALLEN COLLINS BAND in 1983. Tragedy struck the band again in 1986 when Collins crashed his car while driving drunk near his home in Jacksonville, killing his girlfriend and leaving him permanently paralyzed from the waist down. In 1987, Lynyrd Skynyrd reunited for a full-scale tour with crash survivors Gary Rossington, Billy Powell, Leon Wilkeson and Artimus Pyle and former guitarist Ed King. Ronnie Van Zant's younger brother, Johnny, took over as the new lead singer and primary songwriter. Because of Collins' paralysis, he was only able to participate as the musical director, choosing Randall Hall, his former bandmate in the Allen Collins Band, as his stand-in. Collins was stricken with pneumonia in 1989 and died on January 23, 1990. This reuniting of the band as meant to be a one-time tribute to the original lineup, captured on the double-live album “SOUTHERN BY THE GRACE OF GOD/LYNYRD SKYNYRD TRIBUTE TOUR – 1987”, but because of an overwhelmingly positive reaction by fans, the band decided to stay together and record new material. The band is still out touring, though tragedy continues to follow them. In 2001, Wilkeson was found dead in his hotel room, the result of a liver/lung disease. On November 28, 2005, the Rock and Roll Hall of Fame announced that Lynyrd Skynyrd would be inducted at the Waldorf Astoria Hotel in Manhattan on March 13, 2006. Lynyrd Skynyrd had been nominated 7 times. Southern rock is the genre for which we feel the most affinity. The Allman Brothers brought us to this style of rock and roll…Skynyrd became one of our more favored bands. On Sunday mornings at R.I.T., "FREE BIRD" was the song we pumped into the fraternity house to get the football or basketball or softball teams psyched up prior to their playing in the Fraternity league on campus. That was so very very satisfying, Vinny, I had to get my lighter and wave it around. Great write up about one of my all time most favorite bands. So much talent and so much bad luck. Never heard that tidbit about Aerosmith and the plane before. Talk about sad. I'll be back in the morning to enjoy the tuneage again - YAY!!! Just love being tutored with the likes of Lynard Skynard...woooo BAYBEE!!!!! Thanks for a great lesson, Mr. B!!! You are a wealth of musical knowledge and for someone like me who is not, it's very cool! By the way, it's too bad that I hung up just before you got on the air last night-would've been a hoot to say hello to my Bond!!! MAGS: I enjoy sharing with those who want to learn.... Music to be is a precious gift, that you unwrap with care and stare and listen to in wonder. If I can share some of the joy and sorrow I have found through music with my dear guests, then all is well. I was hoping Mo would pick me up at the same time, but he does not like having two guest on at once...You have an incredible laugh Ms. Mags. I am a HUGE Skynyrd fan. Today is Wednesday which means Tuesday's Gone!! They were great. Cheers Vinny!! What southern girl doesn't like Skynyrd ???? WOOOOOOOOOOO! Excellent, Vinny! Love this new feature. Oh my goodness.... when we used to sit on the beach and smoke pot and listen to Dean play, it NEVER failed that we would have people holler from afar, "Play Free biiiiird!!!" And of course, the man played the damned Free Bird....lol. I think I've heard Dean do it more than Skynard...ha ha ha! Although you should hear my soulful rendition of Sweet Home Alabama. It rawks! Starrlight - how could I NOT like Skynyrd? I spent my teen years in the late 70s and early 80s on the beaches of South Florida listening to Southern "Fried" Rock. Absolutely Awesome! This is one of my favorite groups! I look forward to many more of the TT's in the future! What tragedy they experienced, how very sad. As you know, I am enthralled with the 70's bands. This new feature is something I will read and re-read again and again. Thank you so much, Vince! Forgot to mention (but I know you remember) that we have the original album cover to "Street Survivors" - complete with flames. Could probably sell that on eBay, but we're not interested. Yup! wish I was... and I found one.. it's a beautiful thing. Gimme Three Steps is the Chicklet's Fav Skynyrd song LOL.. calls it the bar song Bwahahahahahahahaha!! You sure should...lol. I am so fortunate that Dean is willing to share me with my Man-tourage...lol. Although, what does that say about me?? If more all-girl bands tried to name themselves after their gym teachers, we'd have several all-girl bands named "Bull Dyke." C'mon that's funny. I love lesbians! Just not the mean ones. In fact, if CZJ ever asks you, I am a lesbian. Love the name of the feature and the idea of the feature. Of course it goes without saying that I LOVE ME SOME SKYNRD! I know how you feel about the Allmans, as do I, but I always rank Skynrd just a shade higher. Two reasons for that - Ronnie's vocals and the three guitars. Just hitting their stride, then the accident. I didn't know that about Aerosmith either. Makes me a little angry after all this time. I'm looking forward to more of this feature. Great job! You know...Tuneage Tutelage would make a terrific BTR show. Great post on Skynard. I've been a big fan since the beginning. I have not been able to listen to Free Bird in its entirety since 1978 when I head it at a close friend's funeral (he committed suicide on his 21st birthday and Free Bird was his favorite song). Hope this comment is not too depressing, I just think of my friend every time I hear Lynard Skynard. Man, you do the walk. While I am a huge Synyrd fan and knew most of the info, it is uncanny how well you tell the story and organize the details. I salute you!